Yes, it’s a good one. It’s not only the bottle that’s fancy, more importantly, the liquid inside is also worthy of a thumbs up. While the French oak was on the brink of being too much on the nose, the first sip got rid of all doubts – this is a very well-made, balanced, heavily peated, young Islay malt as it should be. Very pleased to see this will be a permanent product in the Port Charlotte lineup! Instantly one of the better 10 years olds out there. Proper Islay whisky, but with a Bruichladdich twist. Well-rounded and integrated, this shows a remarkable amount of farmy aromas, which is quite lovely actually. The peat smoke plays its role. Never too dominant, but always unmistakably present. There's a soft layer of sweet, tinned pineapple, as well as candied banana and vanilla custard. Good, oily texture. Mouth-coating. Lots of soot, and plenty of peat and rubber, as well as just a whisper of gun powder. Spices play a role on the palate as well. Mainly cracked black peppercorns. Lingering spices, some gunpowder. Finally some berries as well. Long. Tasty and tasty. Very balanced, not too dominant smoke. The alcohol is in my opinion very well involved, so I do not need water here. medium long, smoky, light fruit sweetness, pleasantly woody. Nice mouthfeel. Epic 10 years old Islay whisky with a great balance. 87/88. Salted caramel, honey, peat, vanilla pudding, banana, pineapple and citruses. Powerful and oily. Peat, pepper, gunpowder, citruses, oak and tropical fruits. Peat with a very generous vanilla. Fruit with flesh, white peach ... It is very delicate behind the peat. Fine, fluid and juicy texture. The peat does not crush, it's really elegant. direct peat but not very strong, just dosed! woody return very interesting, taking! then the citrus fruits a little candied, rather cooked which give a side toasted. on the same aromas, rather long, but monolithic. Dense camp fire smoke and fine smoked aromas are immediately present. Vanilla and citrus fruits follow quickly, subtle hints of pastry hide behind them - maybe shortbread? Pineapple, tangerines and hard-to-define bright fruits merge with many herbs and a pleasant spice of oak. A salty sea breeze lays like a thin veil over the flavors. The strong alcohol content (50%) causes a slight cooling in the nose, but overall is quite well involved. The texture is - as so often in Port Charlotte - velvety soft, the onset quite voluminous. The strong smoke is there immediately, but tastes pleasantly sweet. Vast vanilla notes, honey and even slightly tropical fruit notes need not hide from the dense camp fire smoke with fine aromas of räuer. Juicy pineapple, a hint of coconut, lemon juice, pepper, pastries, salt, various herbs and spicy oak wood notes complete the diverse range of aromas. The alcohol is well integrated for my taste, I add no water. Medium to long, smoky and sweet and spicy. The 40ppm smoke also develops its power on the finish line. Pepper, bright fruit notes, a touch of strawberries and beautiful vanilla notes flash shortly before spicy-smokey aromas end the Port Charlotte. Maritime notes linger in the background. 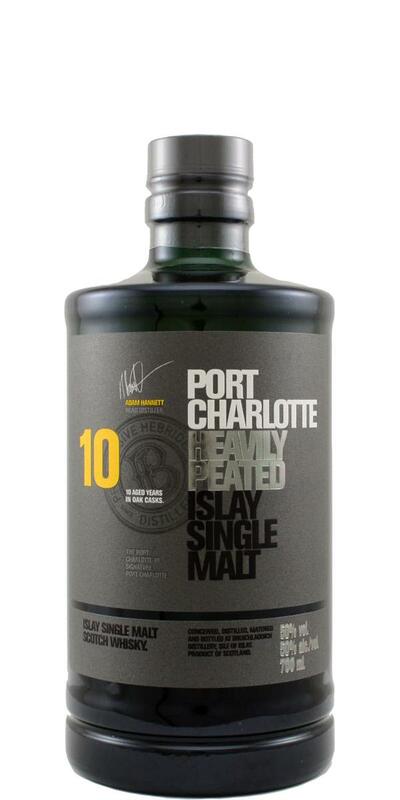 Port Charlotte is one of my favourite islay whiskies and i was quite happy that they released a new 10yo standard bottling. its a quality dram without a doubt but its not to my liking. first of all the nose is rather quiet, the peat is more restrained,the phenolic level rather low. but whats really putting me off, is that dominant winey note. 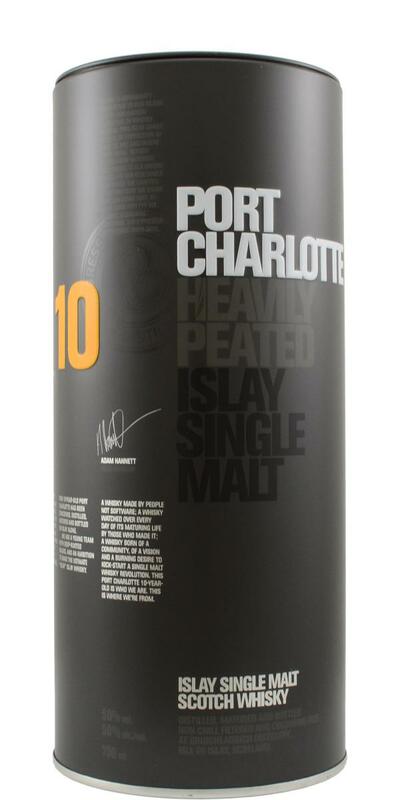 i drank their latest releases octomore 10, laddie 10 v2 and the port charlotte v2. they were also a mix of wine, sherry and bourbon casks and it was a nice variety. but honestly i didnt expect them to go on mixing wine casks into their regualar bottlings. long story short: its a decent drink, with a almost great body and aöpowerful lengthy finish. peat is more prominent in mouth and finish as it is in the nose. also the wine note is not as powerful as it was in the nose. but the peat level seems low. its stats 40ppm but behaves more like 20 or so. its muted by thath rose wine notes i guess. if you have no problem with wine cask whisky in general than consider it a fine dram at a reasonable price point (50€/0,7L/50% Alc). If you're more classy and like your common bourbon and sherry influenced islay whisky maybe order a sample first. nevertheless: its good stuff, the bottle didnt last for long, altough i dont see me buying another bottle. This level of peat is the "love it or hate it" stuff. I assume those that hate it doesn't buy a bottle with "heavily peated" on the tube. But for those that do, for a 10YO and for the price, this is truely great. It sais heavily peated, and yes it's above average. HB pencil, smoked meat with herbs. Sweet BBQ sauce on smoked ribbs. Good level of peppery spice. Yet an underlying lightness of fruityness. Quite long, sweet and spicy. Dry smoke with a peaty tang last the longest. A smoke, fruity, and malty dram.